It’s always the witching hour in this game by Playson, themed around Halloween and all things spooky! Any horror movie fans or those intrigued by dark magic will not be able to get enough of this game. If you love promo's, check our new slot bonuses today. New kids on the block Playson have only been operating since 2010, but since this time they have built a formidable reputation for offering ‘Unique Gaming Solutions’. 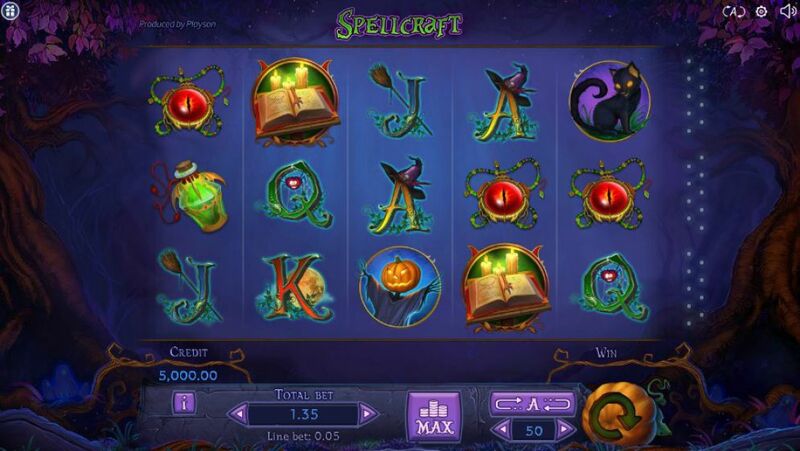 Players can look forward to unique features such as ‘Ghost Reels’ in Spellcraft. For a similarly spooky theme from Playson, try your hand at Zombirthday! 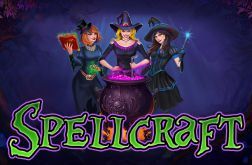 The secrets of magic lie within the shimmering spell book, so unsurprisingly this is your highest scoring icon – line up 5 of them on the reels to win 600 coins! You don’t want to lose track of the powerful voodoo doll either – 5 of these will win you 500 coins. Meanwhile make sure you pay attention in potions class, as the bubbling cauldron is worth 400 coins. Funnily enough, the green circle with WILD written across it is the Wild symbol, and will substitute for anything other than the Scatter. Another Wild icon is the auburn haired witch, who only appears on the central reel. The Scatter icon is the black haired witch, whose evil gaze emerges from under the sweeping brim of her hat. 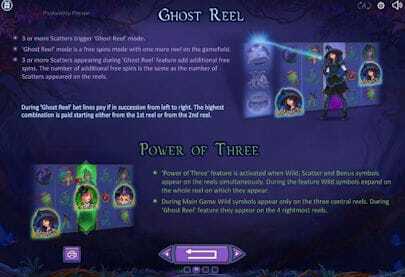 3 or more of her triggers the Ghost Reels feature which sees an additional reel added to your screen and awards some free spins! Next there is the blonde witch – even though her manic laughing face strikes fear into anyone who sees it, you’ll be wanting to see a lot of her in this game. She is the Bonus symbol and triggers a 4-round bonus game. Each round sees you pick an object which will win you cash bonuses, multipliers or ‘ingredients’. As you gain ingredients the potion bottle fills up – if you fill it you will received 30x your total stake on top of any other bonus cash prizes you received! Finally, if at any point all 3 witches appear on the reels you will trigger the Power of Three bonus feature – this sees the red-haired witch become and Expanding Wild. The 4-round bonus game adds a fun new layer to this game and improves its longevity, as well as offering plenty of opportunities to win cash! The Ghost Reel feature is also unique and adds an exciting new element to play, ensuring players won’t get bored. With 27 fixed pay lines and fairly high minimum stakes, this enticing game will best be enjoyed by mid-high rollers.